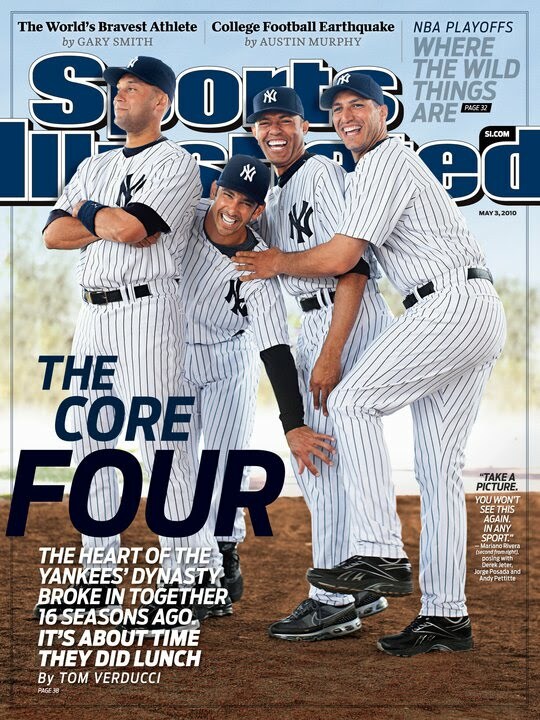 As the Core Four’s careers wind down, can the Yankees keep a smile on their faces? Earlier in the week, we suggested that Joe Girardi’s legacy as Yankee manager would depend on how he shepherds the Yankees’ core of aging veterans through the twilight of their respective careers. Making the task even more challenging for Girardi is that he played alongside these legends during the primes of their careers. As a result, you couldn’t blame the Yankees skipper if he allows sentimentality to play at least a small role in how he handles this precarious issue. Although Girardi has been very diplomatic on the subject, Brian Cashman has not. According to recent comments, it seems that if the Yankees’ general manager has his way, sentimentality will have no impact on how the team treats its veteran stars. Rob Neyer called Cashman “his hero” for the above statement, but as a lifelong Yankee fan, I find it somewhat disturbing, especially because it can’t be dismissed as tough talk. We’ve already seen this sentiment put into action with how the team handled the end of Bernie Williams’ career. Following the 2006 season, Joe Torre still seemed inclined to have the popular centerfielder play a role on the team, but Cashman refused to relent and only offered Williams a non guaranteed invitation to Spring Training. In other words, Bernie Williams never really retired. The Yankees effectively ended his career. At the time, most Yankees’ fans seemed fine with the decision because Williams’ talents had obviously declined. I, however, was not. Although winning is clearly the number one mission statement, the Yankees should be about more than just one bottom line. George Steinbrenner was famously quoted as saying the only thing he cared about more than winning was breathing, but under the Boss, the Yankees’ organization placed great emphasis on promoting a family culture. Once a Yankee, always a Yankee so to speak. Much was made of Steinbrenner’s itchy trigger finger, but the truth of the matter was being fired or released from the Yankees just meant a reunion would soon be in the planning. Make no mistake about it. Before Steinbrenner took over, the Yankees reputation had always been as a very bottom line organization. Even Babe Ruth was jettisoned when he no longer was the Sultan of Swat. And, to be sure, that philosophy probably played a role in the franchise’s perennial success. Having said that, the Yankees shouldn’t have to choose between winning and placating their veteran stars. After all, the team’s history is defined by more than just wins and losses, but also the men who make them possible. The decline of legends like Derek Jeter, Jorge Posada, Andy Pettitte and Mariano Rivera (well, maybe not Mo) is inevitable, and at some point, the Yankees will have to move on. However, they don’t need to do it in such a cutthroat way. In the case of Bernie, there was no reason for not giving him a guaranteed deal. Even if the money was a concern, would the Yankees really have been worse off with Williams taking the roster spot of guys like Andy Phillips, Josh Phelps and Kevin Thompson? Luckily, Bernie’s relationship with the Yankees remains strong, but it would have been a shame had the result of the team’s decision been estrangement from one of its homegrown stars. Do we really follow sports only to watch a winner? If so, why not jump from bandwagon to bandwagon? Although many casual fans do take that approach, the diehard’s attachment to a team stems more from its history than its prospects for future success. Because of their financial advantage, the Yankees can have their cake and eat it too. As a result, the team shouldn’t feel the need to abide by Branch Rickey’s famous advice about trading “a player a year too early rather than a year too late” when handling its Hall of Fame core. The Yankees can still win while catering to their stars. The end doesn’t always justify the means, and in this case, the cost of winning in the future doesn’t have to involve turning away from history. Totally agree. It chills me to the bone to think that they’d do to the Core Four, any of them, what they did to Bernie W. Or, come to think of it, to Joe Torre. I’m disappointed Girardi was signed for another three years — I think he made some really bad decisions in the playoffs — but if he can treat the guys right and keep Cashman on a leash, then he’ll be an asset for sure. Bandwagon to bandwagon? Like blackjack McDowell, Cone, Tino, Clemens, R Johnson, Giambi, J Damon, A-rod, Sabathia, Texera… That’s just off the top of my head. Players who beat the yankees, Yankee fans hated them, then embraced them the next year. Yankees mgmt, players and fans dont care about play loyalty. Where’s the fun if you’re playing with quadruple the resources of anyone else? Where’s the fun if you can only be surprised by a loss ? Not sure about your point. My bandwagon reference was made regarding fans. Players are free to do whatever they choose. It’s their profession. A real fan, however, is stuck with his team, and therefore that attachment should be justified by more than just winning games. Maybe most everyone else doesn’t care about loyalty, but I do. I don’t really expect it so much from players because they come and go, but I would like to see “my team” exhibit the quality because it his hear to stay.